1. 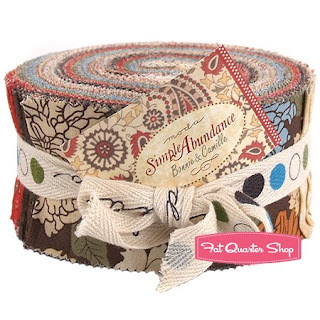 Simple Abundance Jelly Roll by Bonnie & Camille for Moda. I only have one charm pack from this line and am seriously in need of more! 2. 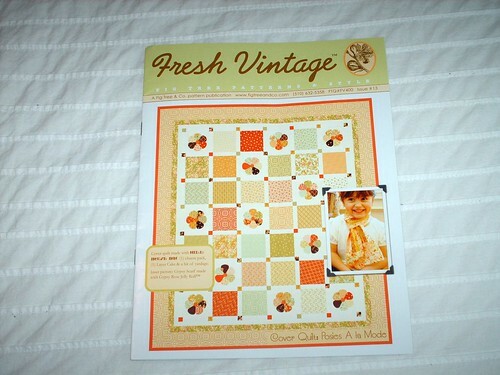 Calm Dolce Fat Quarter Bundle from Tanya Whelan. Gosh...it's really just so pretty, isn't it? 3. 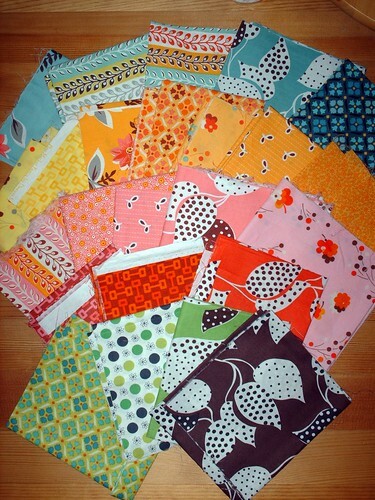 Cool Nicey Jane Fat Quarter Bundle from Heather Bailey. I just love Heather's designs so much, and I'm pretty sure she was the first designer I stumbled upon when I started sewing again! Now Santa, I know you and I haven't had contact for a number of years now, but we're friends right? Remember that time in 1987 when I set up my whole Barbie and the Rockers set for you to see? Or how I used to leave you apple juice instead of milk because you said in your letter that you were lactose intolerant*? I think we enjoyed a pretty good run, but now that I'm a graduate student and can't really get fabric for myself, if you could grant just one of these wishes, I'd be forever grateful! *When I was growing up my Uncle Dan would stop by the house around midnight on Christmas Eve and eat the cookies, drink the juice, and write me a response to the letters I left for Santa. He was lactose intolerant and really liked apple juice (he also really liked stale licorice which is weird). If you would like to get in on the "Dear Santa"-action, head on over to the Fat Quarter Shop's Jolly Jabber blog! So much fabric-love, so little time...until next week that is! This last week of school is going by so fast! Only two days left and I have one paper and one presentation still due. Can't wait until Friday night when we celebrate both the holiday season and getting through the semester with a party at my friend Melissa's. Saturday I work and then Alex and I head to his parents place for Hanukkah. Next week will be all about relaxing, getting some Christmas presents finished, and probably baking. 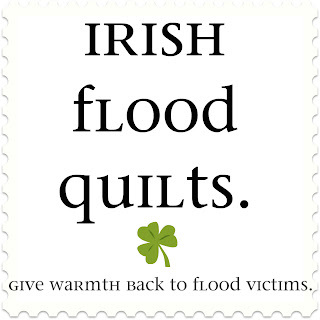 I have finished three of my disappearing nine patch blocks for the Irish Flood Quilts project. These are made using Hello Betty by Chloe's Closet for Moda and some white cotton. I only have enough of the Hello Betty left to make another three blocks, but I think its not the quantity so much as the love behind them that counts. They're also 13.5 inches square each, so they're not small. They're not perfect as this was my first time ever trying the disappearing nine patch blocks, but I think they're neat and there will definitely be more in my future. 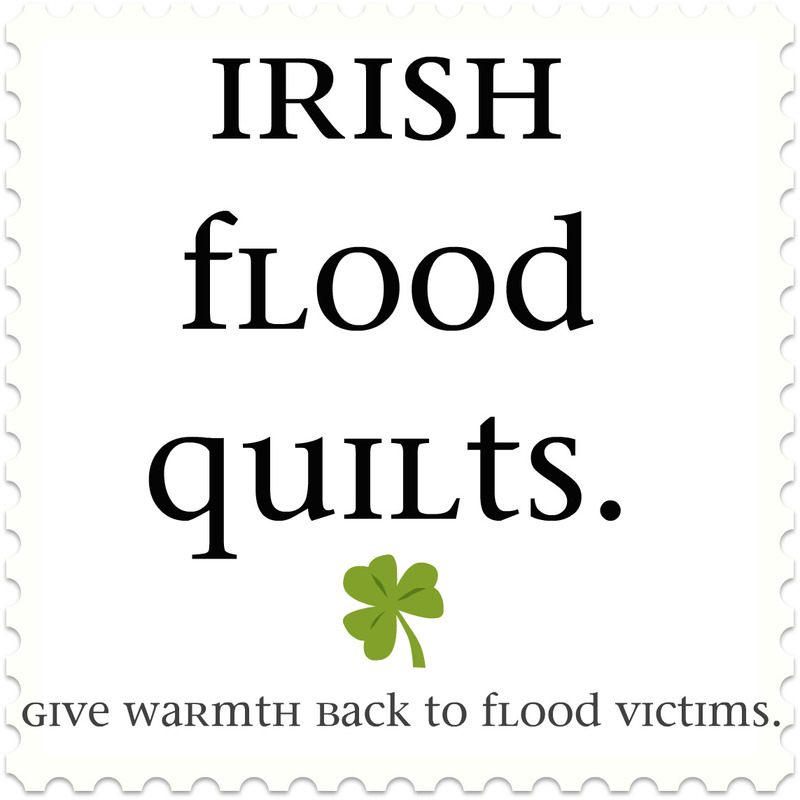 If you would like more information of the Irish Flood Quilts project please visit Irish Quilting Magazine's flood relief page. Would you like to come to the kitchen with me? There's a surprise in there hanging out with Genevieve. Do you see what I see? There's a little bundle of gorgeousness making friends with Genevieve. Do you know what it is? Would you like to see more? Yes...okay! It's a bundle of Flea Market Fancy cuts! The lovely Katy over at I'm a Ginger Monkey took pity on me when I mentioned to her that I hadn't been able to afford FMF when it first came out and now it has gotten way too expensive because it's out of print. Katy said that she remembered what it was like being a student and offered to send me some of her horde. I had no idea it was going to be like this! Katy apparently cut a piece off of every print of Flea Market Fancy she had! And many of the pieces are larger - I thought she was going to send me a handful of scraps, which I would have been over-the-moon about anyway, but this little bundle sent my heart afluttering! 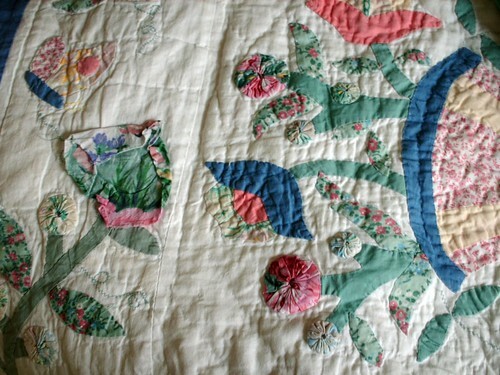 I had originally been thinking about making a string quilt for myself with whatever she sent me, but now I'm not sure because I don't want to obscure any of the loveliness of the prints by cutting them into smaller pieces. Thank you Katy - you are the loveliest, most rockin', and most generous lady! You should all go over and visit Katy and say hi because she really is pretty awesome (you should see her new tattoo!! Did you guys know that I have a couple of tattoos?) and I know you won't be disappointed! By the way, did you see my Christmas apron sitting out in the picture of FMF and Genevieve (on top of two other aprons actually - I like aprons!)? I love that apron, I just pulled it out on Sunday because it was in the box with the tree decorations. I plan on wearing it a lot over the next few weeks! Speaking of decorations, I tried to take some pictures of the tree and our menorah to share but they're not looking right so I'll try again later and report back. Well, in the end I ended up with 433 comments (oh my)! I used the random number generator and the winner is Barbie of Quilting Barbie. Congratulations to Barbie, yay! I will shoot you an email in a little bit for your address and then I will send out your little package of goodies, I really hope you like them! Thanks ever so much to everyone who entered my little giveaway - all of your kind and generous comments mean so much to me! I am especially grateful for those people who liked what they saw and decided to stick around and become followers - I hope I don't lose any of you now that the giveaway is over! I promise I'm really interesting sometimes! For those of you who may be a little sad about not winning, how about a fabric picture to cheer you up? 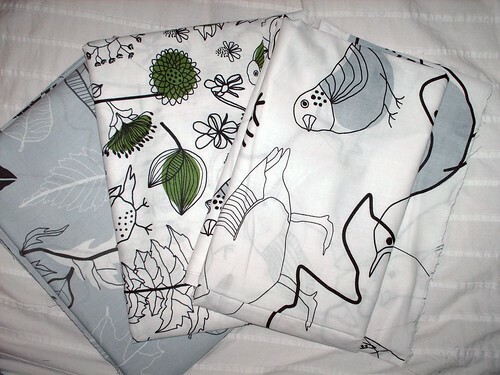 These fabrics are from Ikea, and all three are from the Cecilia collection (100% cotton and only 2.99 a metre CDN), woot! Alex and I went to Ikea today to get our Christmas tree (which I will show pictures of very soon) and a couple other baubles. We also headed to Canadian Tire for our tree stand, and then to Winners (of all places) to buy our menorah. 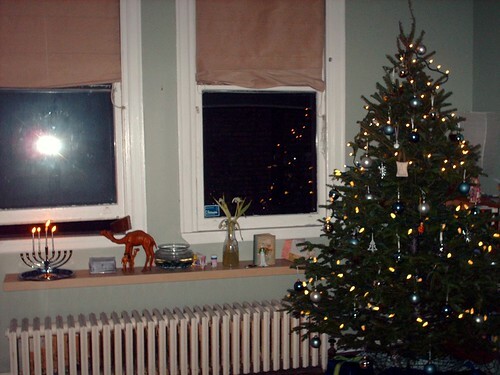 That's right, we celebrate Chrismukkah around these parts! Okay, I'm off to bed! If I'm not around much this week it's because it's the last week of the semester and I have four things due and I still have to work! Oh, the life of a graduate student! Oh and P.S. if you left me a comment on the giveaway post asking me a question or anything like that and I didn't respond back to you I'm really sorry! I tried to respond to most comments, but it was a little overwhelming. If you have something you want to ask or anything else, either leave me another comment here or email me! Thanks everyone! Hey everybody! Just a couple of things: I just wanted to say thank you to everyone that has entered the giveaway so far! As of right now I'm at 327 comments! Also, thank you to everyone who has decided to start following my blog because they like what they see, I hope I don't lose any of you when the contest is over. Second: My Viliya Quilt is being featured on the JWD Publishing blog today. Go on over and check it out! It hasn't gotten any comments so far (*sad face*), so if you'd like to leave a comment I'd appreciate it! If you're looking for the Sew, Mama, Sew giveaway post it's here! 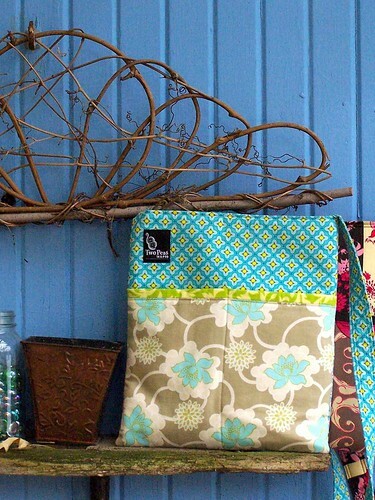 Yay, Sew Mama Sew's annual giveaway day is finally here! I'm so excited to be taking part for the first time, and I may even be more excited to check out everyone else's wonderful giveaways. 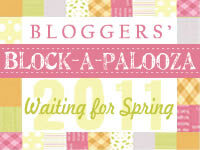 Head on over to the Sew, Mama, Sew blog to find the master lists with links to all the goodies! So up for grabs today we have a tote bag handmade by me using fabric from Joel Dewberry's Chestnut Hill collection with a cotton canvas bottom to add stability. 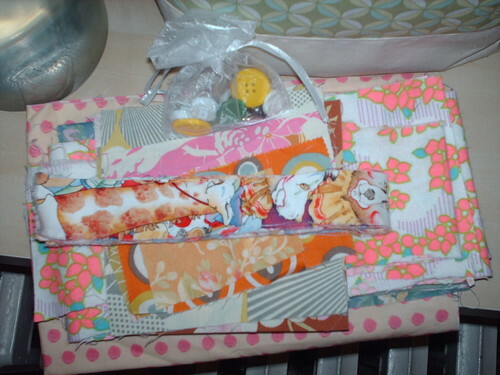 Also included will be some stash builders - a bag of buttons, and a stash of fabric scraps. 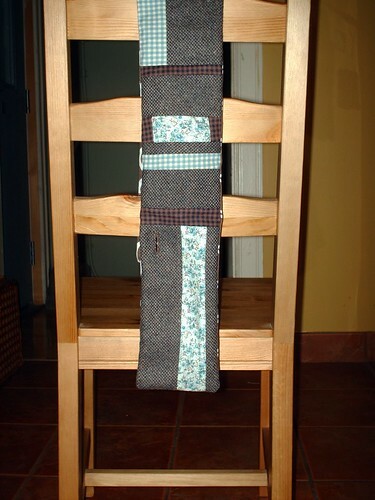 The fabric is a mix of designer (including Amy Butler, Tina Givens, and Moda) and random cotton, and some flannel. Okay so here's what you have to do to enter: leave me a comment (preferably something other than "pick me!") for one entry, if you are a follower (or become one) leave me a second comment saying so and you'll get a second entry. That's it! Please make sure I have a way to contact you so that if you win I can let you know! This giveaway is open internationally and comments will close on December 6th (as per the giveaway guidelines). I will announce the winner here on the blog that day and send an email to the winner. I have another giveaway for you! The ever-amazing and sweet Trish Preston of Two Peas in a Pod Designs (who I’ve mentioned quite a few times; most recently here) just released her first sewing pattern and has generously agreed to give one away to you, my sweet readers. 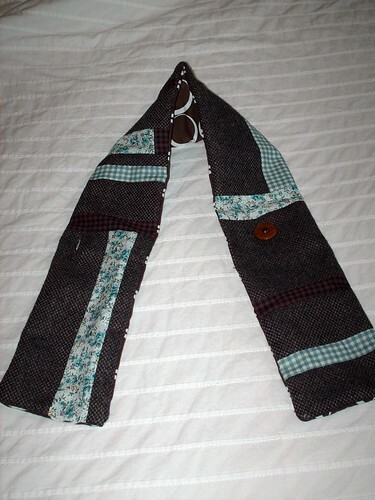 Trish is so (sew) talented and does wonders with whatever fabric you put in her way. Not only does she take part in craft shows and host workshops, she also has an Etsy shop where she sells her beautiful creations. She is the mother of three (the eldest are twin girls, hence “Two Peas”! ), a wife to one, works at a university, and creates her beautiful, handmade items as a side business. Now on to the giveaway! 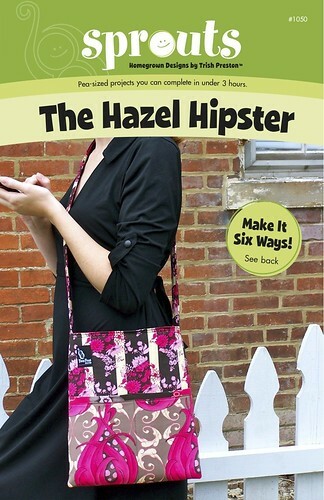 Trish’s pattern line is called Sprouts and her first release is The Hazel Hipster pattern. Not only does this pattern include the instructions for the full-sized bag seen on the cover, it also includes the instructions for a mini-version perfect for a little purse-toting girl. The pattern also has instructions for different exterior pocket variations. Trish’s instructions are clear and concise, and there are lots of pictures to help you along the way! Trish made sure that the pattern was tested by various people before having it printed (I was originally supposed to help out with this, but you all know about my sewing machine woes), and the final product is excellent! Trish also sells this pattern in her Etsy shop, so be sure to head on over and buy one if you don’t win it here. Supporting handmade, and those who put their hearts into it, is always in style! Even if you are not a sewer yourself, think about what a lovely holiday gift this would make for the person in your life who does. To enter this giveaway please leave a comment on this post. If you are a follower of my blog, please leave a second comment and you will get an extra entry. This will not give you any extra entries, but if you’d like please head over to Trish’s blog and leave her a comment – they’re always nice to receive! This giveaway is open internationally – I will ship anywhere! I will leave the giveaway open for one week, and will announce the winner here on the blog on either Sunday or Monday (November 29th or 30th) next week. 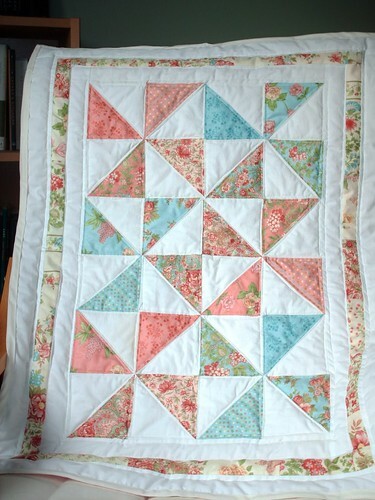 So I am finished the pinwheel baby quilt I’ve been working on, yay! I finished hand-stitching the binding on while having a Glee/crafting night with Erica on Friday and I’m really liking how it turned out. I wish that the binding wasn’t ivory since it’s against white sashing, but I couldn’t find another colour I liked and didn’t having any matching fabric to make my own. I quilted inside each triangle piece and within the white sashing (but not in the pieced border), because I don’t like to over-quilt baby blankets because I find it can make them a bit too stiff. 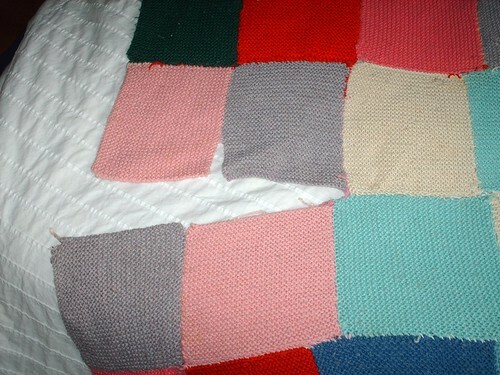 I used a pink and white flannel that is just so soft and snugly for the backing. I love this backing fabric so much that I’ve been considering just hoarding it for myself, but that would defeat the point of it being so soft and snugly – it really is just meant for little ones. 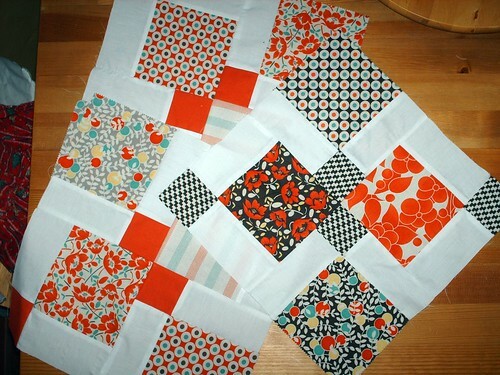 I used this tutorial from Vanessa to make the pinwheel blocks and gosh is it easy! 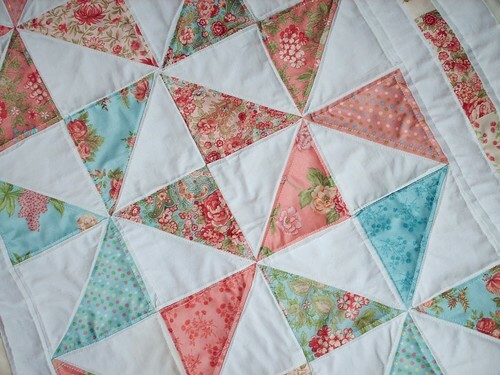 It really is better than piecing each triangle piece to another individually (hehe, I just noticed when going to put the link in for Vanessa's tutorial that she also did a pieced border around the pinwheels...great minds think alike and all that you know). I’m currently working on some cute little embroideries and some Christmas ornaments that I’ll be sharing when they’re all done. I’m feeling a little overwhelmed with the upcoming Holiday season approaching so quickly; I really want to make a little something for everyone but I’m worried that I’m running out of time. Do you think some people will be willing to take Holiday rain checks? I finally got a half-decent picture of Alex and I from Halloween. Unfortunately you still can't see Alex's tail or my legs (and socks, haha! ), but I think we look cute. 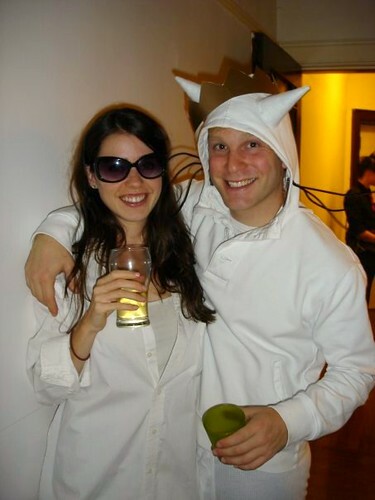 As a reminder, I was Tom Cruise in Risky Business and Alex was Max from Where the Wild Things Are. Alex's ears and tail were the first thing I made using Genevieve, and Alex made his crown all by himself! Because I’m working on some stuff right now (but also wanted to blog), this post will include lots of pictures, but not quite as many words as usual. 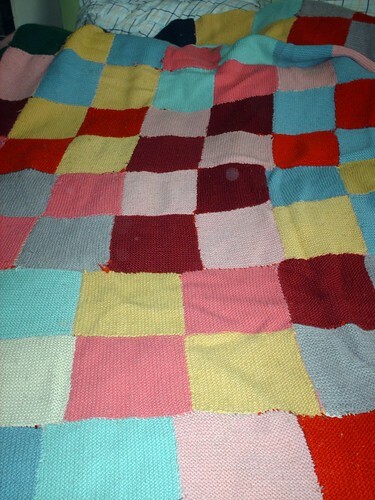 This blanket is the last one my Great-Grandmother made before she passed away. She passed away when my Mum was still a girl, so I never met her, but I’ve had this blanket for as long as I can remember. It’s a tad wonky, but that makes me love it all the more! Unfortunately though some of the blocks are starting to come apart, and I think my Mum may have already had to do a repair job on it at some point. Hopefully I have enough matching pieces of yarn that I don’t have to buy whole skeins just to repair this. We’ll see what happens. You don’t get a picture of the whole thing until it’s done. This beauty belongs to my Mum (she didn’t make it though) and I’m repairing it for her. There’s a giant kinda-funny, kinda-sad, kinda-ridiculous story that goes along with it, but you don’t get that until it’s done. And I’m almost done the pinwheel quilt that I’ve been working on – all I need to do is sew on the binding. 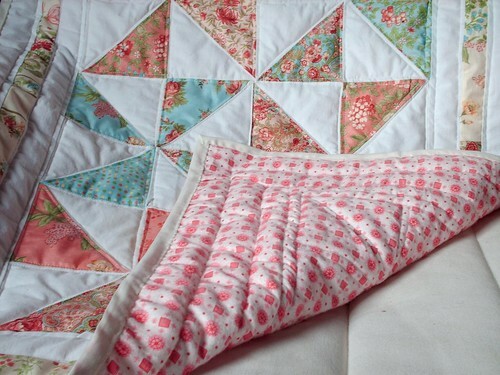 It’s not the pinwheel quilt that I mentioned in this post though – that one is still in progress. I got an amazing package in the mail from my friend Trish on Friday. I knew she was sending me a little Halloween bag she made (unfortunately the post system is super-slow so it didn’t arrive in time, but there’s always next year!) and some fusible fleece. She mentioned that she was going to be including something else as a belated birthday present, but I had no idea what it would be. Here’s the cute bag she made. 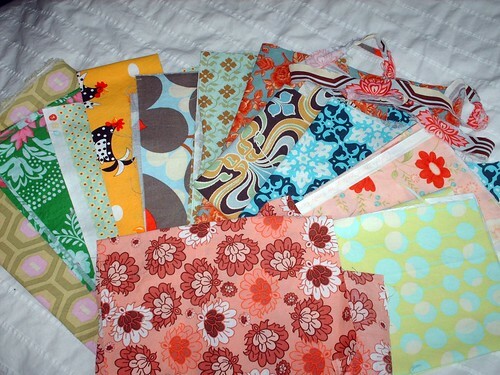 Look at all that gorgeous fabric – it’s all pieces and scraps from Trish’s stash! Now wasn’t that generous of her? Speaking of Trish, keep an eye out on my blog over the next couple of weeks. Trish just released her first sewing pattern and has generously offered to send one over my way so that I can do a giveaway here on the blog. As soon as it arrives I’ll put it up! -I want one of these...okay really, maybe one in every size. -I am taking part in Beki’s Blogger Ornament Exchange, doesn’t this sound like fun? 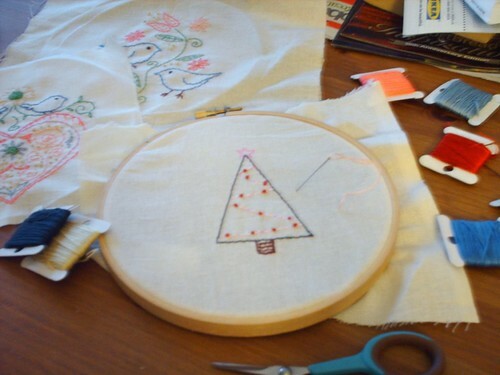 -I just discovered this blog this morning...who knew they had a craft blog? -I could seriously use some of this. It comes out soon; don’t you just love Denyse Schmidt?! If anyone has a line on some Flea Market Fancy at a decent price, I’d love to know about it! 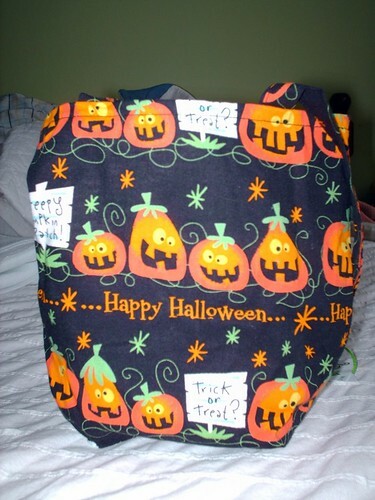 -I really need to start doing more sewing, etc that’s easier to tote around. I’ve been embroidering a bit which is fun, but I’m too scared to take my knitting anywhere with me. I wouldn’t want anyone to make fun of me and my stripey scarves. -Rachel is just too cute! You should see the gushy comment she left on the previous post when she found out she won my giveaway – I just love making people happy! -Weird question, I know, but I lost two of my followers after to my last post (people who’ve been reading for a bit) and was wondering: did I say anything weird or off-colour in my previous post? I read over it, but didn’t see anything. Just wondering is all. 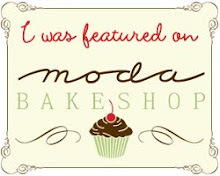 Sewing machines, cupcakes, and a giveaway winner...oh my! The winner of my first giveaway will be announced at the end of this post – that’s right, I’m going to make you read my ramblings before you find out who it is. Conversely you could also just skip to the end of this to post to find out who it is, but that would spoil all my fun, now wouldn’t it? I have so much to share, but don’t think I’ll be able to get through it all today. 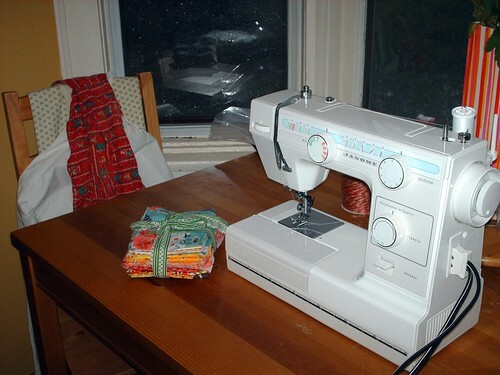 Let’s start with my amazing sewing machine story! Many of you have been through the dark times of going through three sewing machines (since May) with me and have already heard the stories, so I won’t repeat it here but you can read about it here and here. I found a Janome RX 18S for a good price on Craigslist and my Mum offered to buy it for me as my Christmas present. I was a little sad when I thought about the idea of not getting any presents at Christmas, but figured that since sewing makes me really happy it wouldn’t matter. I posted about going to look at the machine in my previous post, but then something amazing happened! The wonderful Cathi, who lives not that far away from me here in Toronto, emailed to say that she had a Janome which she had barely used and that it was mine for the taking if I wanted it. I couldn’t believe it! I went and saw Cathi that night, and met her very nice husband too; since the manual wasn’t with the machine Cathi showed me how to thread it (it’s a little bit trickier than others, although this may be because I haven’t had a machine newer than about 1974) and we chatted for a bit. I tried to offer Cathi something for the machine, but she wouldn’t take anything and said that she only wanted to see pictures on my blog of what I made with it – I can do that! Isn’t she pretty? Her name is Genevieve. Since the machine doesn’t have a case I had to haul it home in my duffel bag and ended up with few bruises for my troubles (the machine was smacking me in the knee and lower thigh all the way home), but it was worth it! Isn’t that the best story you’ve heard in awhile? I can never fully thank Cathi for the kindness she’s shown me – she’ll never know what it meant to me to have someone be so nice to me! Maybe, if you’d like, you could go over to Cathi’s blog and say something nice to her. She’s an amazing quilter, so you should go over anyway just to look at all her great quilts and blocks and pictures of her two cute kitties. Now for a few other things. About a week and a half ago, right before the Singer died, I was working on a quilt top; I was pressing the seams and everything was going well until I went to move the top a bit. My exposed forearm managed to hit the hot plate of the iron and now I have a burn on my arm! I tried to take a picture of it to show, but because it was on the underside of my right arm, that would just not work. It looked pretty heinous there for awhile, but now it’s starting to flake and peel, although I think I might be left with a scar. Ah, the trials of being a quilter! I also got a job last week and completely forgot to mention it in my previous post! I got a job in collections management at Robarts Library (the big library) on Campus. The library is actually attached to the Faculty of Information building so I’ll never have far to go to get to work and today is my first day! I’m very excited because it was looking like I was going to have to just take any job to help pay for school since I couldn’t find one in a library, but now I have and it’s wonderful. This past weekend, as you know, was Halloween. Alex and I headed to an apartment party; I was dressed as Tom Cruise in Risky Business and Alex was Max from Where the Wild Things Are. I don’t have a good picture of us right now, but if one surfaces I’ll post it. I made the ears and tail (on Genevieve) for Alex’s costume and Alex made his crown and used pipe cleaners to make whiskers. I wore one of Alex’s white dress shirts, white socks, white boxers I have, and sunglasses. I also made these cupcakes for the party. They’re Devil’s Food with vanilla icing. 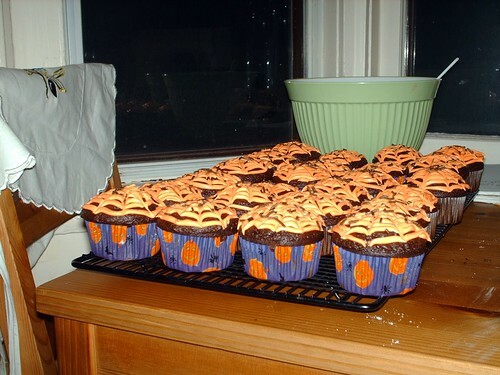 I dyed the icing orange and piped it onto the cupcakes running a skewer through it to make a spiderweb pattern. I also added chocolate sprinkles to look like little spiders. They were pretty good if I do say so myself! I’m thinking that after I get my work done for this week I’m going to finish that quilt I started before the Singer died. I might also get some stuff done up for my Etsy shop, we’ll see how it goes since I’ll be at work on Saturday. Okay, now for the giveaway winner...it’s Rachel from Lost in the Attic with Cupcakes. Congratulations Rachel! Please email me your address and I’ll mail it out right away. I really hope you like it! I mentioned a few posts ago that I wanted to do a giveaway in honour of the readers who have been with me for awhile and all of the new people who found my blog via Amy’s Blogger’s Quilt Festival (everyone can enter though). Well the day is finally here – welcome to my first giveaway! I’m so excited to be doing this! I’ve won a few giveaways in the past and I love the anticipation of waiting for your goodies to appear in the mail. Actually I recently won a giveaway from Fig Tree & Co. hosted by Pink Chalk Studios, here’s what I won. It’s a copy of Fresh Vintage, Fig Tree & Co’s quarterly pattern magazine. It includes patterns, book reviews, recipes and more. I really love it and might need to get a subscription; you can read about it here. I absolutely love Fig Tree so this was the perfect thing for me to win! Joanna (owner of Fig Tree) actually stopped by my blog in August and left a comment on Madeleine the Monkey because I used fabrics from the Mill House Inn collection in her construction, isn’t that sweet? Okay, now on to the giveaway! There is a bit of a story that goes along with the making of this item, but I think I’ll show it to you first! How does that sound? Good? Okay! It’s a scarflette! Sorry about the picture, but I had to take it of myself using the timer on my camera and a chair (don’t ask, it was quite a production). 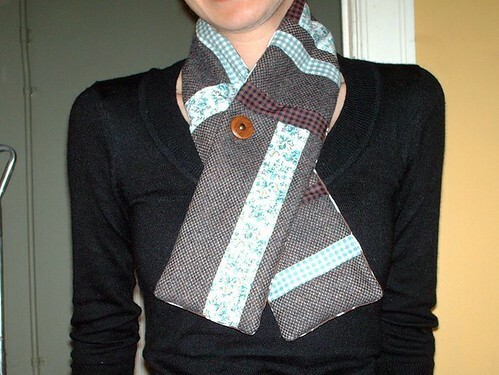 I like the idea of scarflette’s because they don’t bunch up under your jacket like a normal scarf, they’re lighter and smaller to wear when it’s chilly (but not freezing), and because they button (or at least this one does) you don’t need to worry about it shifting or gaping too much at the neck. This is the first scarflette I’ve ever made and I designed the pattern myself. The materials are a tweedy wool, quilting cotton, the floral is a cotton lawn (not Liberty, but still really nice), and the button (I think) is a plastic resin but it looks like wood. It’s backed with a soft, heavier weight cotton in chocolate brown with a white circle design. I’m kinda proud of myself I must admit. Do you want to hear my story now? Okay, so I finished a quilt top on Saturday/Sunday morning and then decided to get going on the scarflette. The idea had been churning in my head for awhile, but I wanted to get the quilt top done first. Everything was going good until I got to sewing the last piece of cotton to the length of my scarf; I got about 2 inches into it and then my sewing machine JUST STOPPED! You’re going to need a little background info here: I had a Singer Stylist 513 that I absolutely loved, but unfortunately the Singer Stylists suffer from belt and gear rot and while sewing the cushion covers for our living room one of the gears inside the machine disintegrated. I was devastated, and wasn’t able to get it fixed (that’s another story). 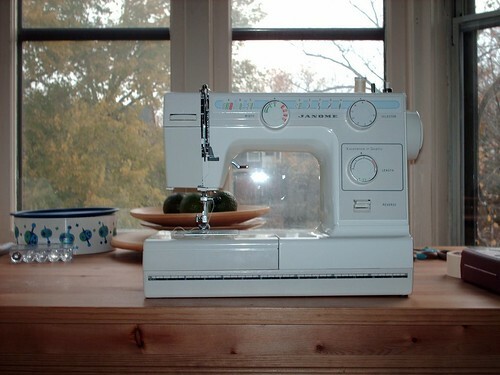 I then borrowed one of my Grandmother’s Kenmore sewing machines from the 70s, but really hated it. I mentioned (in this post) that my Mum was contemplating buying me a new sewing machine for my birthday, but instead my Grandparents ended up getting me a Singer Stylist 514 (they thought it was the same model as my 513). I only got it two weeks ago and hadn’t had a chance to even blog about it yet, but it’s broken too! I’m so upset. I’m going to look at a Janome RX 18S tonight that is a really good price and seems to be in good condition (does anyone have this machine? What do you think?). My Mum offered to buy it for me as my Christmas present. I’ll be kind of sad to not get any presents on Christmas, but at least I’ll have a (good quality) working sewing machine. Leave a comment on this post with anything you like – although if it’s complimentary that would be nice too! Oh, and if you don’t mind, I think it would be neat to see where everyone lives, so leave your city and state/province/etc in the comments (if this makes you uncomfortable, don’t worry about it). The giveaway is also open internationally, I don’t mind shipping anywhere. The giveaway will be open for one week and I will announce the winner either next Wednesday or Thursday. Good luck everyone! Please come back again to see who the winner is, and hopefully whoever that person is will supply me with a photo of them wearing the scarflette when they receive it.